"I was looking at two different isoforms of a protein, and it was important to know if the cells were expressing just one versus the other or both in a given cell. That was tricky until Milo came. We’re also getting more relevant information because Milo allows us to look at expression of this protein in tissue biopsies." Medicine. The Giannakakou lab is part of the Division of Hematology and Oncology in the Department of Medicine, where they study microtubule-dependent cellular events and the mechanism of action for microtubule-targeting drugs. Prashant’s focus is understanding the molecular mechanisms of taxanes and their resistance in prostate and gastric cancer. Taxanes are microtubule inhibitors used as a first or second line chemotherapy. Therapeutic usefulness of these microtubule inhibitors becomes limited when many patients acquire drug resistance to the treatment. 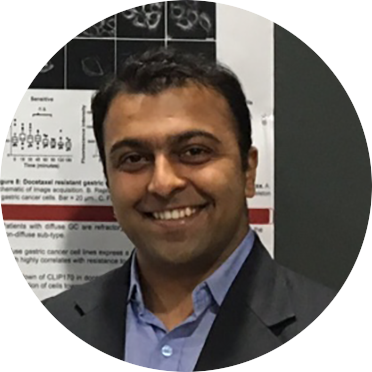 Prashant studies proteins involved in causing cells to become resistant which can be used as predictive biomarkers to determine the best treatment plan for patients. This knowledge can also be used to create drugs that could eventually be used as combination therapies to undo and bypass the resistance mechanism in cancer cells. Prashant and other lab members have discovered a new role for a protein involved in taxane resistance in cancer cells. He was investigating how the two isoforms of this protein, created by alternative transcription in cells, played an important role in the resistance mechanism. With traditional Western blots, Prashant would only be able to detect the presence of the two isoforms from a pool of cells without being able to detect the presence of the isoforms on a single cell level. As part of ongoing clinical trials with doctors at New York Presbyterian Hospital, the Giannakakos lab has access to cancer patient samples. However, the patient samples are limited in quantity and the detection of their protein of interest by traditional western blotting techniques would be not be possible due to very low input material. The Milo™ Single-Cell Western platform gave Prashant the ability to look at which isoform was expressed in a single cell. He could finally look at a heterogenous population of cells and know whether he was looking at cells expressing both isoforms and to what ratio, or whether he was looking at cells expressing one isoform or the other. Because he’s getting information on the heterogeneity of his sample and the distribution of isoforms, he’s getting a better understanding of the role of the two protein isoforms in conferring taxane resistance to the cells. Prashant’s also able to use patient samples in his studies for the first time since Milo needs less sample to look at expression of his protein in tissue. He’s able to get more clinically-relevant information because he can now do studies previously done in cell line models with tissue biopsies instead. Prashant will be running more of his patient samples on Milo to tease apart the mechanisms of taxane resistance. Milo’s ability to give him data on the single-cell level continues to fuel what inspires him as a scientist — the joy of discovery and new insight.